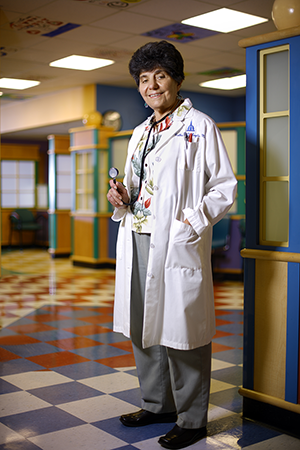 Dr. Catherine D. DeAngelis, the 2015 Howland Medal Awardee, is all that and more. But she is perplexed. Others know exactly why she was chosen to receive the medal at the 2015 Pediatric Academic Societies meeting in San Diego, April 25-28. “Dr. DeAngelis’ career has been characterized by institutional, national and international leadership,” writes Dr. George J. Dover, pediatrician-in-chief at Johns Hopkins Children’s Center, in his nomination letter. She has led “virtually every national pediatric organization,” he writes, authored more than 200 peer-reviewed publications and a dozen books. She was editor-in-chief of JAMA from 2000-2011. At the Johns Hopkins School of Medicine, under her leadership, 36 fellows completed training in general academic pediatrics. Of those, 27 are in full-time academics, two work in government agencies and six are in private practice with part-time academic appointments. The American Board of Pediatrics was just one of the many organizations she led, serving over three decades on numerous ABP committees and subboards, and ultimately chairing the ABP Board of Directors in 1996. At the same time she was on the ABP Board, she also was serving on the Pediatric Residency Review Committee (chair from 1990-92) of the Accreditation Council for Graduate Medical Education (ACGME), and was a member of the ACGME board from 1995-2000. She started her career as a registered nurse in 1960. By 1969, though, she had earned her medical degree from the University of Pittsburg School of Medicine, and three years after that, a master’s in public health from Harvard. She has seven honorary degrees and has delivered 17 commencement addresses. Most of her career has been spent in Baltimore, MD, at Johns Hopkins University School of Medicine, where she did her pediatric residency in 1970-72. She joined the Johns Hopkins faculty as an associate professor of pediatrics in 1978, and from 1980-2011, held a joint appointment in the Johns Hopkins School of Hygiene and Public Health. Look far enough into her resume and you find other surprising facts—she was a special consultant to Disney Educational Programs (1989-90), wrote a weekly column called “The Younger Set” in The Baltimore Sun (1987-90) and wrote the forward in Peak Performance: Coaching the Canine Athlete. Officially, she is University Distinguished Service Professor Emerita, professor of pediatrics emerita at the Johns Hopkins University School of Medicine, professor of health policy and management at the Johns Hopkins Bloomberg School of Public Health and editor in chief emerita of JAMA. But despite all “emeriti” statuses, she stays active on committees and at the university.